"Measure twice, cut once" - meaning "check before acting or committing..." We ('way too frequently) get calls from integrators telling us that the ventilation provisions they made for an installation "aren't working". Sometimes it's because they left the choice of vent openings up to the cabinet maker, who didn't have a clear picture of what was going into the cabinet and what would be needed to avoid heat damage. Sometimes it's because "just making a few 2 inch holes here and there" may be great for running wires, but won't move much air. Once a too-small hole is drilled, the center is lost and it can be hard to enlarge it, as in going from a 2" to a 3" diameter, or larger. There are ways to do it, but the easiest way is to "get it right the first time". That's where we come in. Bring ATM in early when equipment is going into a cabinet, closet, or other enclosure. Tell us about it, send in a few JPGs, or scan a sketch & email it. We'll look at it, probably ask a few questions, and recommend an effective cooling system that will avoid thermal damage to the gear, and do it quietly and automatically. Whether it's a residential or commercial installation, let us take the guesswork out of the picture. With hundreds of thousands of systems sold since 1999, there aren't many thermal problems we haven't seen - and solved. Effective October 1, 2017, all ATM products will carry a 5 year parts & labor warranty. This will be a "common sense" warranty. Obvious abuse, lightning strikes, etc. will not be covered, nor will shipping charges. But "It just stopped working", "One of the fans is making noise" -- covered. 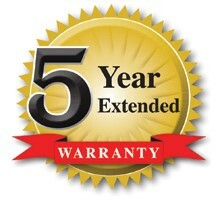 The complete warranty is available at activethermal.com on the Downloads page. We see this as an opportunity to increase your customers' confidence in cooling their systems, and in ATM products in particular. Thanks for reading -- see you next edition.